I read Le Petit Prince in French class in junior high or high school, and I can't say I ever really understood what it was about, or at least not well enough to stick with me in any way. I was literally just trying to decode the words on the page for an assignment. So I have no particular fondness for the book. It is simply a thing I know to exist in the world. But when I saw the trailer for Mark Osborne's (Kung Fu Panda, The Spongebob Squarepants Movie) new adaptation, I was quite eager for its release. I mean, look at this trailer. It's amazing! There was some drama around the release, in that Paramount produced it, it premiered in France and made a ton of money (for a movie playing in France), but then Paramount suddenly dropped it from its release schedule, citing too many competing kids movies this summer, or some such reason. Because apparently Ice Age 47: Not Extinct Yet, Again, and Still was too intimidating. In stepped Netflix, and we got a day-and-date limited theatrical release and Netflix premiere on Friday. Paramount. Paramount, Paramount, Paramount. What did you do? 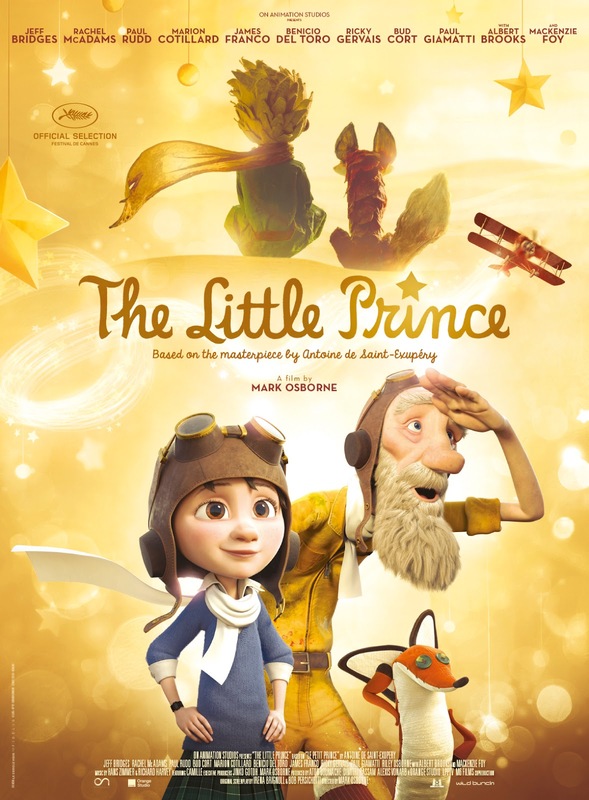 This is not a straight adaptation of Antoine de Saint-Exupéry's novella, but instead the elderly neighbor of the main character recounts the Saint-Exupéry story as something that happened to him many years ago. He is The Aviator, and the narrator of the original book. The Girl has been moved into a new house and put on a rigorous routine by her well-meaning but micro-managing mother in order to get her into a prestigious school. It is a story where a child who has too little of childhood is allowed to reconnect with the innocence and wonder she has had to stifle within her. You know the drill. But the characters are all wonderfully animated and performed by a great cast, the animation is beautiful, the storytelling is subtle and breathtakingly elegant when it needs to be, and when the two worlds of the film collide — when The Girl sets out to actually find the Little Prince after all of these years — I just dissolved into a weeping mess. My wife and I have a running joke that since our kids were born, I cry at everything, even movies I don't like. This is largely true. But this time, I heard her sniffling, too, so I know that this one is legit. And my kids are really the reason why I was moved so much by this picture. I took my daughter to see Inside Out, and it was a terrible experience. She cried on and off for most of the movie, and I didn't blame her one bit. It was sad as hell. My take-away was that I had just spent nearly two hours watching a little girl's childhood die right in front of me, and you know how you're holding your 6-year-old daughter in your arms right now? This is all going to happen to her in a couple years, too, and it'll mostly be your fault, so fun afternoon at the movies, yeah? I thought Inside Out was masterful filmmaking, but I never wanted to see it again. Like Requiem for a Dream. But the point was basically that to grow up, your childhood has to die. And that's ok, it's just part of it, and it's how we grow. By and large, that's probably true. But the story of The Little Prince is the opposite: as you grow up, it is imperative that you not let your childhood leave you. You must carry with you a curiosity for the world, and an openness for magic, unexpected experiences. There are a lot of things out there that would rob this world of its magic for us, and thankfully, The Little Prince is one of the things that gives a little bit of it back to us. Nerd coefficient: 9/10, only because I almost never, ever give anything a 10/10. Check back with me in five years, and maybe I'll give it another point for longevity or lasting influence. This is as good as feature animation comes. Posted by Vance K - Emmy-winning producer, sometime animator, cult film reviewer and nerds of a feather co-editor since 2012.